FoamWerks Foamboard T-Clips quickly slide onto foamboard to form perfect corners and adjoining walls. T-Clips are great for temporary assembly while gluing or to quickly construct models. FoamWerks Foamboard L-Clips quickly slide onto foamboard to form perfect corners and adjoining walls. L-Clips are great for temporary assembly while gluing or to quickly construct models. Cut unique shapes and designs into matboard using the Logan Freestyle handheld mat cutter. 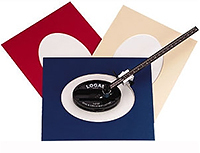 It's easy to use with either your left or right hand, and is Logan's most affordable mat cutter. Follow traced designs by pushing or pulling the cutter. Available in red or silver. Uses Logan 324 blade. 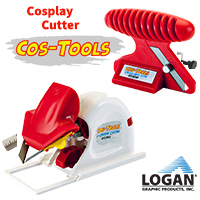 The Logan Push Style handheld mat cutter includes a retractable blade. The blade slot prevents blade flex, resulting in straighter cuts. A start-and-stop indicator helps to eliminate overcuts. Can upgrade for use on the Adapt-A-Rule straight edge and Compact or Simplex board mounted mat cutting systems. Uses Logan 270 blade. The Deluxe Pull Style is Logan's most advanced handheld mat cutter, including features developed and refined by Logan since 1974. The Deluxe Pull Style includes a marker bar system for faster marking, a pivot-and-pull blade, and an ergonomic handle. The blade slot prevents blade flex, resulting in straighter cuts. A start-and-stop indicator helps to eliminate overcuts. New ergonomic knob for comfortable operation. Can upgrade for use on the Adapt-A-Rule straight edge and Compact or Simplex board mounted mat cutting systems. Uses Logan 270 blade. Technology meets artistry with the new Logan Model 5000 8-ply mat cutter. Designed to cut both 8-ply and 4-ply mat board, the 5000 features an ergonomic grip and an indicator light that glows when the blade is fully engaged. A quick-change magnetic blade cartridge easily flips from 8-ply to 4-ply setting. Uses Logan 270 (double bevel edge) or 271 (single bevel edge) blades and is compatible with Logan models 301-S, 450, 750, 700-S, Team Systems, and Adapt-a-Rules. A handheld freestyle v-grooving tool to enhance photos or artwork with decorative surface v-grooves. Pull style action allows freestyle v-grooving or can be used to follow traced designs. Features two blades that v-groove the surface of the matboard only. An onboard storage compartment keeps extra blades handy at all times. Uses Logan 324 blade. Pull type 90-degree straight cutter has comfortable 3"(7.62cm) ergonomic handle. Features an adjustable depth pivot cutting action. Use with any suitable straight edge. 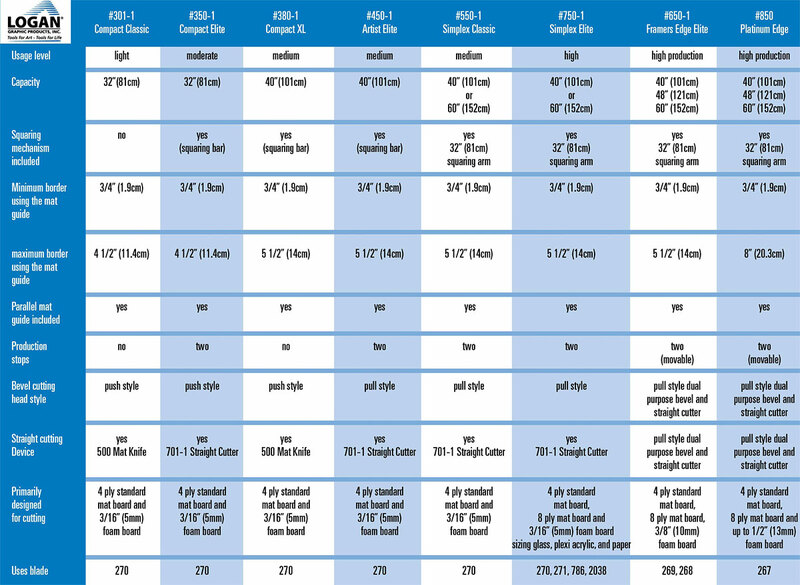 Three depth settings: safety, single sheet, and 3/16" (4.7 mm) foamboard. Includes pre-installed nylon guides and screws to instantly add on to Logan Adapt-A-Rule, Logan Team System, Logan Compact, Logan Intermediate, and Logan SimplexPlus. Includes five replacement blades. Uses Logan 270 blade. New from Logan! Replaces the discontinued 704 Glass Cutter. The 704-1 Glass Cutter Elite easily cuts glass with or without a compatible Logan cutting system. Simply score glass with this tool, then bend slightly to snap the glass, and you have a clean, professional cut. Designed for use with any Logan system using hook on cutting heads: Team System, Adapt a Rule, Compact, Intermediate, Artist, and Simplex. Does not work with other Logan models, but can be used with any straightedge. Uses Logan #786 hardened steel cutting wheels. Includes bottle of cutting fluid and one glass wheel. Made in USA. 3-step mechanism is fast, portable, very easy to use, and costs hundreds less than comparable oval cutters. Cuts perfect bevel openings without connecting to any other equipment. Cut single, double, or even triple mats. Adjusts from oval to circle cutter with a simple twist of the knob. Cut ovals from 3-1/4" x 4-3/4" (8.25cm x 12cm) to 20"x 23" (51cm x 58cm) and circles from 4-3/4" to 20" (11.5cm x 51cm) diameter. Maximum difference between oval width and oval height is 3" (7.62cm). Includes creative matting instructions and five extra blades. Uses Logan 324 blade. Use your Logan Handheld Mat Cutter models 2000 Push Style or 4000 Deluxe Pull Style, Straight Cutter, Glass Cutter, or Mat Knife with an Adapt-A-Rule cutting guide and enjoy straighter, faster, more accurate cuts. The 24? (61cm) and 40? (101cm) models include a non-slip rubberized base and US or metric ruled guides. The unruled 60? (152cm) model includes a C-clamp. All models include an Upgrade Kit including nylon guides and screws allowing modification of your Logan Handheld Mat Cutter to then “hook” onto the Adapt-a-Rule. IMPROVED! Get it all at once with a recent improvement of an included mat knife at no extra cost. This practical combo system includes a 24" (61cm) or 40" (101cm) straight edge and a Logan Handheld Mat Cutter for accurate, high quality mat cutting plus a three depth position mat knife with a slip lock depth feature for downsizing standard thickness matboard and foamboard up to 3/16" (4.7 mm). Just mark your borders using the ruled straight edge, attach the cutting head, and cut from line to line. 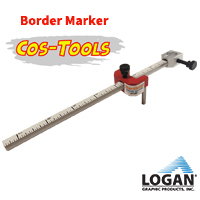 All models include a non-slip rubberized base, US or metric ruled straight edge, and a Logan Handheld Mat Cutter. Can also be used with Logan Glass Cutter or Straight Cutter. Easy to operate 20" (50cm) mat cutting system designed specifically for photographers. Handles matboard up to 16" x 20" (40cm x 50cm). Small 12" x 23" (30.5cm x 58.4cm) system doesn't require much space -- perfect for small studios. Includes parallel mat guide for setting border widths up to 5" (12.7cm), 90-degree squaring bar, straight cutting head, and bevel cutting head. Includes creative matting instructions and five extra blades. capacity mat cutter that provides affordable and professional results. cutting and sliding the material through the length of the machine. fully illustrated matting instruction guide. The 301-1 Compact Classic is ideal for low volume at home framers. Versatile, portable 32" (81cm) capacity mat cutter provides affordable and professional results. Open ended guide rail allows bevel cuts in matboards of any size. Downsize matboard up to 32" (81.3 cm). Includes parallel mat guide for setting border widths from 3/4" (1.9 cm) to 4-1/2" (11.4 cm), fully hinged guide rail to guide cutting heads, scaled production stop, built in squaring bar for holding mat board square, push style bevel cutting head with start and stop indicator, pull style straight cutting head for downsizing mat board and foam board, built-in carry handle in box, five extra blades, a free instructional DVD and a fully illustrated matting instruction guide. A 40" capacity base board mounted mat cutting system with parallel mat guide in aluminum channels, 90 degree squaring bar, 20" removable measuring bar, production stops, hinging guide rail, improved 701-1 Straight Cutter Elite and Pull Style Bevel cutter. Includes creative matting instructions and includes five extra blades. Plus FREE set up and instruction DVD. Uses Logan 270 blade. Alat ini sangat berguna, untuk memotong kayu dengan sudut yang presisi. Cocok untuk pekerjaan membuat Frame photo, shadow box, atau craft lainnya. Olfa Mat cutter ini gunanya untuk motong "Mat Board" (karton tebal yang sering dipakai untuk bagian depan photo didalam frame). Biasanya Mat board harus dipotong dengan sisi potong 45 derajat miring biar cantik, maka dengan alat ini anda dapat memotong sudut miring dengan rapi. Satu set ini sudah berikut 2 buah pisau cadangan. Theta cutter adalah alat potong yang dapat di atur hasil sisi potongnya bersudut 30, 45, 60, 75, dan 90 derajat. Untuk para arsitek, cocok untuk memotong bahan untuk pembuatan maket. The Logan 500 Mat Knife now features a quick adjustment blade holding knob for 8-ply. The knob allows a user to quickly loosen the blade from one depth setting and reset it to a different setting in seconds -- the blade holding knob no longer needs to be removed when resetting the blade depth. This design improvement will not impact the everyday low price. For straight cutting matboard down to size. Use with any suitable straight edge, including Logan Adapt-A-Rule, Logan Team System, and most Logan board mounted cutters. Three depth settings: safety, single sheet, and double thick. Includes three extra blades. Uses Logan 270 blade. Cut foamboard V-grooves to perfection using the FoamWerks Foamboard V-Groove Cutter. Features include adjustable blade depth, quick change blade clips, magnetic blade slot, on-board blade storage drawer and five blades. Will V-groove in up to 1/2" thick foamboard. Use with FoamWerks Channel Rail, Logan Adapt-A-Rule or Team System. Use replacement blades WC-5, WC-20 or WC-50.